How do I extract and create (or duplicate) a Scope Sheet file for a coworker? 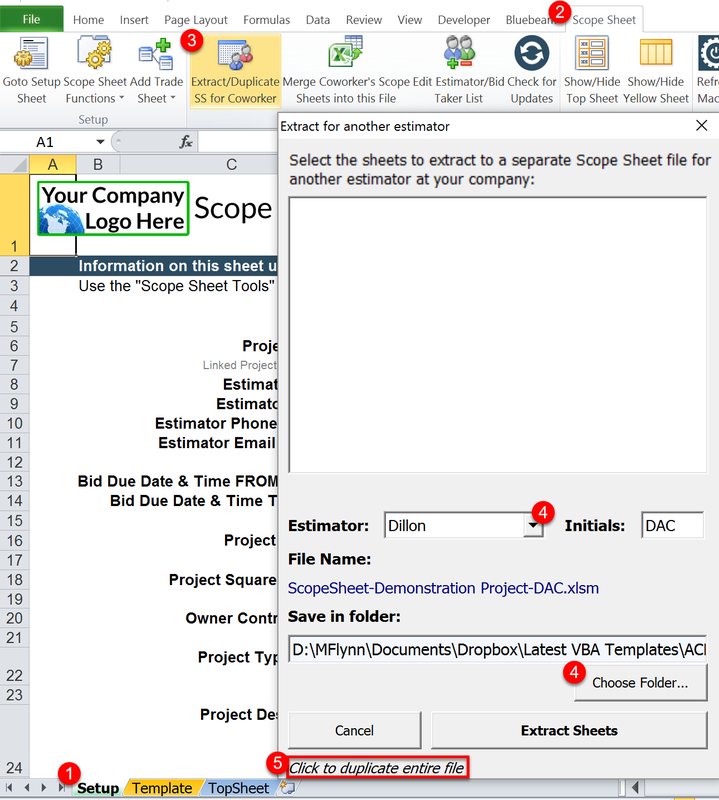 If you are working on a project with more than one person you will want to create separate Scope Sheet Excel files for each estimator. There are two ways to create a file for your coworkers, an extract method and duplicate method. The extract method is easier and recommended. Add all the trade sheets you think you will need for the project. Don’t worry if you added a trade that isn’t needed or if you forgot a trade, trade sheets can be removed or added later. 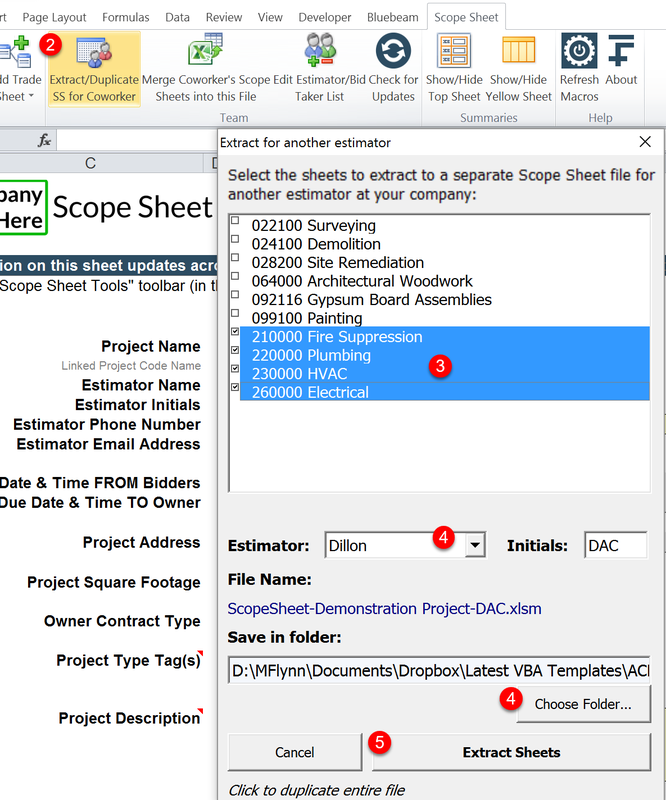 In the Scope Sheet toolbar click “Extract/Duplicate SS for Coworker”. Select the trade sheet(s) you want to extract for your coworker’s Excel Scope Sheet file. Select the estimator and save-to folder. The file will be extracted to the file location you chose. The selected trade sheet(s) will be removed from the current scope sheet file and moved to the other estimator’s file. 7. Optional: Repeat the extract process for each estimator on your project. This creates an exact duplicate of the existing file. Optional: Add trade sheets to the file, however, with this method it is better to just edit the template and not have trade sheets in the file. If you do have trade sheets in the file and duplicate it for a coworker the trade sheet should be deleted from one of the files. The same trade sheet should not be in multiple files. Click “Extract/Duplicate SS for Coworker” button. Choose the estimator and save-to file location. Click the “Click to duplicate entire file” text button. ← Top Sheet: How do I use the Top Sheet (an overview)?